The first American intercollegiate football contest took place on November 6, 1869 between Rutgers College and the College of New Jersey (Princeton) and featured rules similar to English association football (soccer). In the early 1870's, Harvard University began lobbying other colleges for the adoption of standardized rules based upon the "Boston Game," Harvard's football code, which allowed handling and running with the ball. Yale, Columbia, Princeton and Rutgers rejected Harvard's overtures and, on October 20, 1873, adopted the first codified intercollegiate football rules based on association football. Undeterred, Harvard didn't attend the convention and elected to not participate in association football games. Rather than giving up football altogether, Harvard challenged McGill University (Montreal) to a two game series on May 14-15, 1874. Harvard won the first game played by their Boston Game rules. The following day the teams fought to a scoreless draw in a game that featured McGill's Rugby-based rules and oblong football. Enamored with the Rugby rules, Harvard embarked on a campaign to convince other universities to adopt them. On November 13, 1875, Harvard taught the new game to Yale and defeated the Elis 4-0 at Hamilton Park in New Haven before an estimated 2,000 spectators. Harvard's campaign was successful; the intercollegiate football association adopted Rugby-based rules in 1876, American football's first evolutionary step towards the modern game. The Crimson's on-field success against Yale, however, was fleeting. "It was in 1875 that Yale and Harvard first met on a football field. Harvard won. And that rankled. After losing the inaugural battle, the Yale team trained ferociously, mastering tackling and blocking techniques, vowing to perfect the game Harvard had taught them. The training paid off. Yale took over as top dog starting with the second game. The Yale winning streak grew. And grew. And grew. An annual drubbing of the Crimson became routine, and the “little brother” syndrome subsided somewhat. But finally, in 1890, the inevitable happened. After a fifteen-year drought, Harvard at last beat Yale." Two months earlier, over 50 students competed for a position on Harvard University's Class of 1898 Freshman Football Team, sixteen of which tried out for quarterback. An October 8th, 1894 article in the Boston Daily Globe didn't instill much confidence in the applicants, whose average weight of 140 pounds was lighter than most high school teams. On December 1, 1894, the Harvard Class of '98 Freshman team faced Yale's Class of '98 team with its supporters still smarting from the varsity bloodbath. Bolstered by freshman from the varsity squad, the Crimson clung to a 12-6 lead late in the game. In the waning minutes, Yale mounted a furious drive down the field, but the game was called with the Eli's just 4 feet from Harvard's goal. Following their 1890 defeat, Yale returned to dominance, defeating Harvard in each of the next 3 seasons by a combined score of 34-4. In the nineteen years between 1876 and 1894, Yale would be declared national champions sixteen times. On November 24, 1894, Yale defeated Harvard 12-4 in one of the bloodiest contests of the rivalry. Broken noses and collarbones, players sent to the hospital, and violence between fans during and after the game led Harvard's faculty to vote to abolish the football program. While Harvard football would ultimately survive, the rivalry with Yale was suspended for two years. Before the suspension took effect, however, Harvard and Yale played one more game on December 1, 1894. William Woodward was born in New York, New York on April 7, 1876 to William and Sarah Woodward. 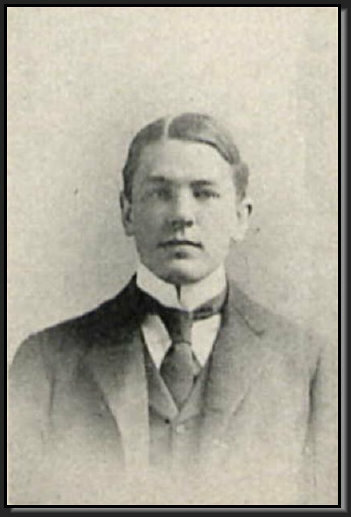 William attended preparatory school at the Groton School in Massachusetts before enrolling at Harvard in 1894 where he played right guard for the Harvard University Freshman Foot Ball Team. There is no record of William playing football beyond his first year at Harvard. William received his bachelor's degree in 1898, master's degree in 1899, and law degree in 1901. He served as secretary to Ambassador Choate in London and became president of Hanover National Bank of the city of New York in 1910. The win marked the first time Harvard defeated Yale in a football game in over four years and helped salve the mental and physical wounds suffered by the Crimson varsity one week earlier. The win was so significant that the Harvard University Freshman Foot Ball Association (H.U.F.F.B.A) had silver trophy cups made to commemorate a single victory. Our February 2019 Artifact of the Month is the trophy cup awarded to right guard, William Woodard in 1894. Measuring 5" tall and 7.5" from handle to handle, the trophy cup was manufactured by N.G. Wood & Sons of Boston Massachusetts.